· Proper Eyewear: Protect children’s eyes from excessive chlorine and chemicals by buying kid-sized goggles. When the kids are ready to take a break from the water, protect their eyes from the sun’s bright rays with sunglasses. Parents should keep a couple sets of replacement lenses in the pool bag just in case someone’s shades get cracked or scratched during a trip. · Pack the Right Swimwear: Huggies® Little Swimmers®disposable swimpants are made for worry-free water play. The easy-open sides make changes a breeze, so everyone can get back to having fun in the sun. Plus, they now have new Finding Dory designs your little fish will love! · Sunscreen: The sun will be out in full force for the summer and that means parents need to protect children’s skin when they are outside. The higher the better when it comes to SPF levels and remember to reapply regularly! · First Aid Kit: Parents should not forget a basic first aid kit. Include plenty of waterproof Band-Aids, antibiotic ointment, children’s pain reliever, ear drops and bug spray. · Towels and Water Bottles: Don't forget to pack the towels and water bottles. Very important to keep hydrated when out in that sun all day and the towels are perfect for drying off and warming up. You can find Huggies® Little Swimmers® in Grocery Stores and mass retailers nationwide. Available in three sizes, Size Small (16-26lb) through Large (over 33 pounds). Suggested Retail Price starting at $9.99 per pack. Yes, we love to visit the water park at Six Flags. We're planning a trip to the beach. The Huggies Little Swimmer would be perfect for fun in the water. No trips planned this year but we go swimming ALOT! We don't have any trips planned, but we go swimming a lot! We plan to go to the Grand Canyon so the swimmers would probably not be of use this vacation. Yes! We are going up to my family cabin on Lake Huron. Little Swimmers make taking the toddler to the beach SO much easier. When it's time to go, take of the swim diaper, rinse the booty and put on a regular diaper and he's ready to go! We don't have any trips planned for this summer. We are planning to go to Dorney Park and Hershey Park so these would definitely make life easier. No far trips planned but a few local,like the zoo,beach,and aquarium about a hour or so away.Swimmers could definitely come in handy at the beach.thanks so much for the chance.I have a 3 yr old daughter and 2yr old son who adore Dory!! We have a couple of days planned at our local amusement park. We always spend a few hours at the water park there so Little Swimmers would come in handy there! No trips planned yet, but we have a pool and I can sure use these for my grandson when he comes over. We plan on going to the beach. 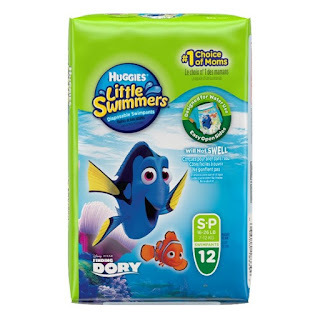 Huggies Little Swimmers would be great for my daughter and her friends to use! We plan on going to Hershey Park. We plan on swimming so the Little Swimmers would be handy to have!